So you're tempted to order fifty exquisite tea-light holders to make your reception sparkle like a fairy palace. But what do you do with them afterwards? Why not give your bridesmaids a present of two halves - something before the ceremony, and then a dozen tea-light holders after your nuptials are over? We think they'll be delighted to be given such a vivid memento of your big day. Wrapped up prettily (a touching way to use up that spool of themed ribbon!) 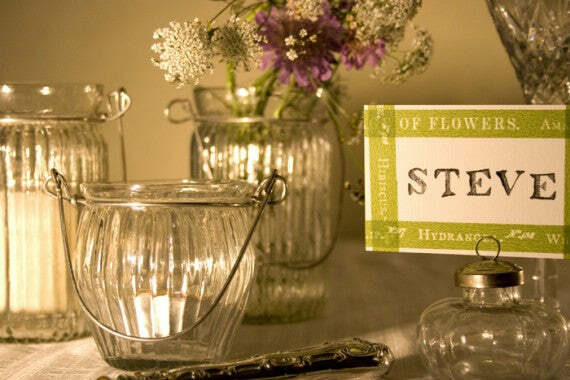 with a thank you luggage tag, our tea-light holders make wonderful, classy, useable gifts. And every time a bridesmaid lights them up, she'll be reminded of your wedding and how you, she and the tea-lights glittered. Both the Mothers’ gifts can be happily sorted this way, too – with goodies that last a lot longer than flowers! Present them with a parcel of divine little vases or elegant name-card holders - every time they use them the joy of your wedding will return. You were a special part of our day; these were too. Thank you! Bridesmaid - thank you for everything! Keep on shining in my life. You helped make the joy of our wedding day – these are to remind you of it!